This lo-fi Les Paul will polarise opinion, but it certainly has a stripped-down charm. Loveable tones and Gibson’s sheer neck at releasing it. The missing bits; killswitch is where the pickup switch should be and vice versa. Run your hand over the lumpy, carved maple cap and the sensation is partly organic, partly school woodwork project. The same is true for the weight-relieved (chambered) mahogany back, complete with Perspex control cavity covers, which at least prove that the BFG wasn't wired by a 15-year-old with his school tie toasting on the soldering iron. The set mahogany neck has a couple of small grumbly glue/finish/grain patches on the back that register, and therefore annoy, in your palm. Still, the rounded fifties profile is a comfortable, reassuring place to be, beginning the BFG's considerable charms as a player. Likewise, well finished frets and the 12-inch radius rosewood 'board will feel like home to Gibson regulars, despite the lack of binding and position markers - at least there are no poorly finished nibs here to catch the strings. Also, the nut is cut noticeably high for the low E string especially, meaning intonation and tuning issues at the first fret until you have it tweaked. And no truss rod cover? Call us old fashioned, but it just looks plain wrong. Despite this mounting body of evidence against the BFG, it is in fact a very rewarding guitar to play, with a healthy dollop of indefinable yet undeniable mojo. You don't feel precious about it in the same way you would some lovingly nitro-finished beauty, encouraging you to lose those inhibitions and just wig out. Taking care of the grunt are a Gibson Burstbucker 3 at the bridge and a Gibson P-90 at the neck. The former is an Alnico II magnet, exposed-coil, non wax-potted pickup, the hottest of Gibson's celebrated Burstbuckers. The coverless P-90 is Gibson's vintage-style model. 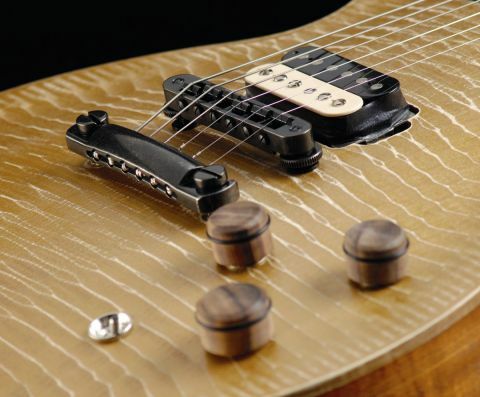 The pickups are controlled by a volume knob apiece, plus a master tone (complete with rubber-ringed, wooden knobs), three-way pickup selector and an intriguing on/off killswitch: useful if you're the kind of player who uses Tom Morello-style staccato techniques. What the finish lacks in, well, being there at all, it makes up for in giving the BFG a lively, resonant voice when played unplugged, helped by the lightweight chambered body. This translates to depth and overtones aplenty when plugged in because even though this zebra beastie is the hottest of the Burstbuckers, it still maintains vintage soul with medium gain sounds. Take care as you push the gain though, the lack of wax potting means potential feedback squeals, plus lots of extraneous noise thanks to mounting the pickup direct to the body. The neck-position P-90 has a warm, mid-rich voice typical of the breed that works as well for blues as it does rock and even jazz. Being a single-coil, it is susceptible to noise, so maybe another humbucker would have been a better choice given the guitar's rock leanings. The killswitch is too clunky for machine-gun stutters, and besides, the knobless pickup selector can still do that, even if its metal threads are about as comfortable as barbed wire underpants. As for their positioning, sadly it's all too easy to just keep switching to complete silence instead of selecting the bridge pickup: we'd swap 'em around. With a current street price around £650, you won't need a big loan to purchase the BFG. You may, however, need to take a huge leap of faith. Gibson has come in for criticism regarding finish issues in recent years so here's an interesting approach: make a guitar where the finish doesn't matter! The basic build of the BFG - general construction, neck alignment, fretting and set-up - is all fine, but are you really going to ignore the laughably rudimentary bib and tucker, even if it is part of the guitar's raison d'etre? Yet the BFG is still a very likeable, pro-sounding instrument once you're playing, exuding idiosyncrasies that vehemently divide opinion: surely the mark of any successful or noteworthy instrument. Baffling yet compelling, it's a perfect example of why logic is utterly wasted on us guitar freaks.